The hit film The Curse of the Were Rabbit follows the eccentric inventor Wallace and his intelligent but silent dog, Gromit, as they come to the rescue of a village plagued by thousands of rabbits in the crucial lead up to their esteemed annual vegetable competition! During an operation to brainwash the rabbits to stop eating the prize vegetables, Wallace presses the wrong button on his wacky ‘manipulation-o-matic’ machine, and swaps personalities with one of the crazed rabbits! Disaster looms! Over run by hundreds of rabbits loose in the house, and with a terrifying Were-rabbit on the rampage, Gromit struggles to cope – he escapes to the kitchen, for a moment of light relief (perhaps for tea and biscuits?) – and this is when a Smeg 50’s Retro Style fridge, star of many Hollywood productions, takes centre stage! Gromit turns to the rather special SMUG fridge – and OPENS IT to discovers hundreds of rabbits packed inside! Find out how they got there, and what Gromit does next by watching the film! Can Gromit save the day?! We have a huge range of Smeg fridges in stock so you too can be ‘smug’ with your own Smeg fridge! The prize ceremony for young directors MOVI&CO was held on 1st December at the Triennale in Milan. The winners included the viral video created for Smeg by Nicola Martini, which interprets the famous FAB fridge from an ironic and fun standpoint. An original creative idea brought to life with a lively rhythm and playful feel. A free and uninhibited look which takes on the difficult task of approaching a style icon in order to interpret its soul in a new way. The film created for Smeg by the young video maker Nicola Martini makes the FAB fridge the star of a fun story, which transforms domestic life into a game. The viral video came about as a result of Smeg’s participation in the VIII edition of MOVI&CO, an annual competition aimed at directors aged between 18 and 35 years of age for the conception and creation of advertisements, viral videos and company films. The closing event took place at the Triennale in Milan with awards given to the most deserving projects. The jury headed by the Rector of the University IULM of Milan Giovanni Puglisi, which also included Renzo Arbore and the director Daniele Lucchetti, awarded the Smeg video the prize for Best Creative Idea. Smeg wanted to be involved in MOVI&CO because they share the spirit of the initiative, which encourages the world of business to interact with that of young people, giving them the opportunities to make full use of their creativity for the development of new and different narrative ideas. It is this freshness that gives extra value to the viral video, it is an unconventional form of communication which offers a new and original interpretation of the product. The 29-year old director Nicola Martini, welcomed the challenge to bring an icon of design like the 50’s retro Style Smeg fridge to the video, and to present an original take on its explosive personality not only in terms of its appearance but also from a functional point of view. The idea originates from a domestic scene, where husband and wife come back home after doing the shopping. They start to put the food away in the fridge as if they were playing an absorbing game of Tetris, with increasing pace and competitive glances emphasised by the progression of the soundtrack inspired by the tune which accompanies the famous video game. In the last frames a virtual Tetris is formed with all the Smeg products from the 50’s Retro Style line in a cheerful puzzle full of colour. The task faced by the director and his troupe required great care and insight so as not to distort or trivialise the product. The end result met all of Smeg’s expectations: the viral video, which will be published on YouTube and on the website www.smeg50style.com, is undoubtedly a good base for continuing to mutually exchange ideas on how to interpret this product’s huge personality. View latest range of Smeg 50’s Style Fridges and Freezers now! Let’s do this in an orderly fashion. First of all, you should know that this is a true story. Now then, some time ago, an alert popped up at the Metropolitan Police ‘s HQ, a system monitoring unusual goings on across the web. Their attention was caught after spotting some messages on Twitter from people claiming to be inside a fridge. Further investigations led the riot squad, kitted out in full uniform, to the East End of London, a place by the name of Artillery Lane. The building, raided by the policemen, was furnished in a vintage style dating back to a bygone era, the trendy 1950’s. The place was called the Breakfast Club. Nobody knows if it was the eclectic and unmatched style, colour, or even the messages and tweets which led them to this secret detention place, but the policemen were instantly directed towards a solitary Smeg fridge in the building. They opened it ,and, with amazement, discovered that the fridge door was in fact the secret passageway to a cell jam-packed with prisoners. They were special prisoners though: captured to lead a life of fun and relaxed small talk, held on the grounds of their passion for places with unique style, hostages of design. 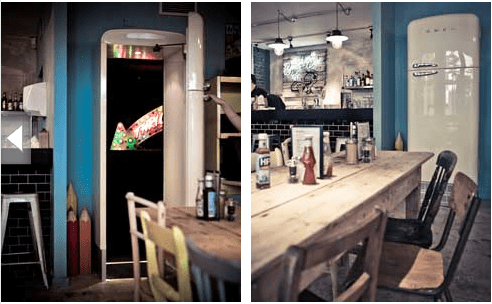 To the policemen, the relaxed atmosphere and the quality of the food and endless menu of drinks the place offered gave them no alternative other than to also declare themselves prisoners for a couple of hours in the bar inside the fridge, run by the Mayor of the mysterious Scaredy Cat Town. Anyone wanting to become a hostage of design should visit http://www.thebreakfastclubcafes.com/ for more info. 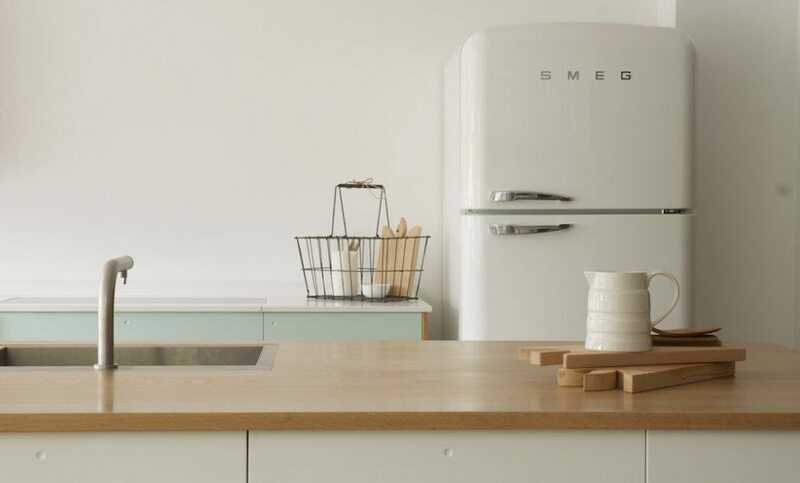 Warm up your house this winter by winning a Smeg 50’s retro style flueless fire. Smeg (UK) is offering one lucky entrant the chance to warm up their house this winter by winning a fabulous Smeg 50’s Style Flueless Fire in the colour of their choice! Smeg fires can enhance any living space. Simple to install and available in a selection of stylish, colourful interchangable frames, Smeg L30FAB fires make use of a unique catalytic converter which requires no flue. All models are 100% efficient and convert all gas to heat! Smeg, the ultimate fire combining both function and beauty! In addition to the main prize, Smeg (UK) is offering x 10 runners up a hotel break for 2 (worth up to £100), choosing from a wide selection of hotels from across the UK. Rangemaster Range Cookers Win 10 Out Of Top 11 Which? ‘Best Buy’ Spots! Contact us online for a package deal or give us a call on 0115 965 1937 and we'll get you the best deal we can. Learn more about our mutlibuy system here.